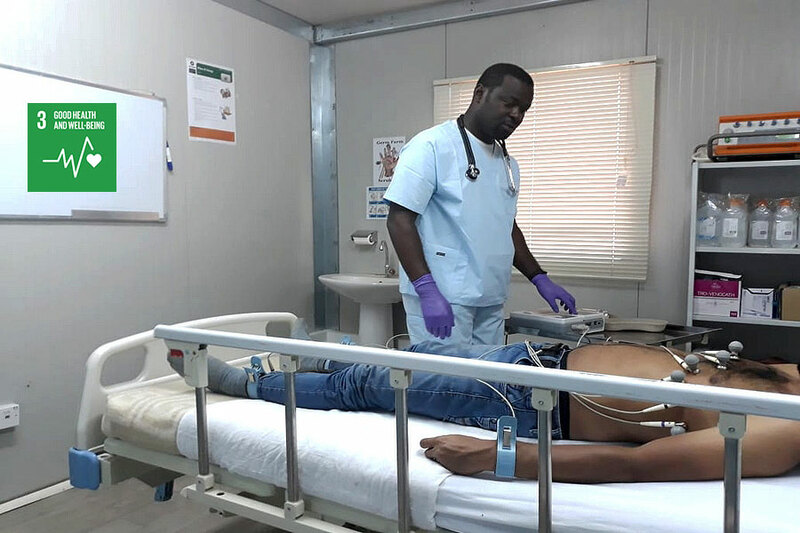 Daniel Bukasa, a native of the Democratic Republic of Congo (DRC), has been serving as a UN Volunteer Medical Officer for the United Nations Multidimensional Integrated Stabilization Mission in the Central African Republic (MINUSCA) for almost two years. He and his colleagues are based in the mission’s offices in Ndele in the Prefecture of Bamingui-Bangoran, 650 km north of the capital Bangui, where they provide health care services to staff of the UN Mission. UN Volunteer Medical Doctor Daniel Bukasa providing medical care to a MINUSCA staff member in the Central African Republic. In this context, the UN Mission staff, including UN Volunteers, must deal with the volatile security situation with the presence of armed groups in the region, minimum access to basic services, and with an environment conducive to spreading tropical diseases such as malaria. Daniel Bukasa brought his long experience in the management of tropical diseases, but also his skills in emergency care of patients. In this context and in collaboration with his colleague, UN Volunteer Nurse Ener de Jesus (the Philippines), they contibute to promoting a healthy environment, especially through the sanitation of water and the environment via fumigation and other means. In total, there are three UN Volunteer Medical Doctors and four UN Volunteer Nurses working for the wellbeing of the staff of the Mission. The Ndele health clinic remains an emergency service and is therefore limited in equipment and services. Sometimes, Dr Daniel must make difficult decisions. This is the case when a patient does not respond to the treatment as expected, in case of severity of the pathologies, or when the services that the patient needs are only accessible in Bangui, which requires a two-hour flight or a road trip of up to four days, according to the season. Dr Daniel says they sometimes have to decide on the evacuation of a patient in record time, which also depends on the weather, flight conditions and sometimes security threats.